After two plus hours of riding in rainstorms and through mud puddles, all pieces are intact and I’m relatively dry. Well known for producing some of the most well-regarded performance outdoor apparel on the planet, Patagonia has decided to expand their mountain bike lineup for 2019. Patagonia now offers two different short and chamois options, three jerseys, a backpack, and hip pack in their mountain bike line. 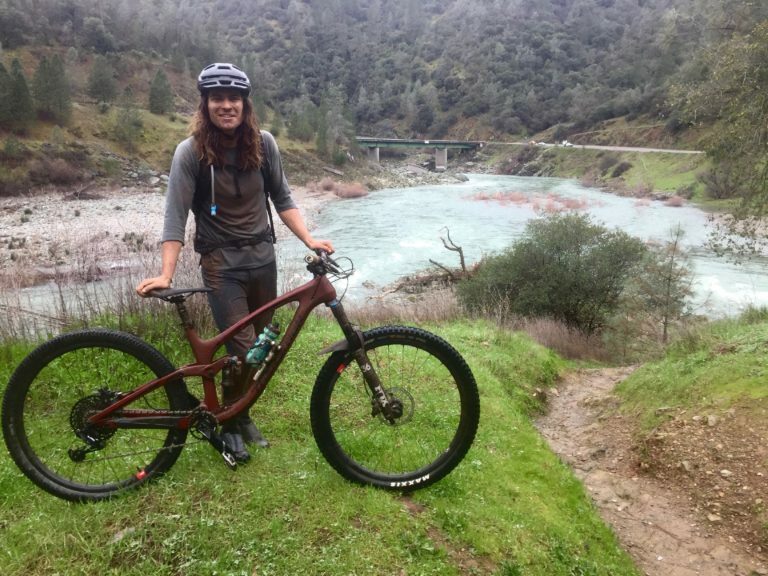 I’ve been testing the Dirt Roamer Short, Nine Trails 3/4 sleeve bike jersey, and Endless Ride Liner Bibs, and here’s what I’ve found. Built from a 4-way stretch fabric of recycled polyester and spandex, with sonic-welded seams holding everything together, the Dirt Roamer shorts are both light and stretchy. This combination results in a garment that conforms to your movements so much so that I often forgot about the shorts, as they mimic the feeling of lycra without the constriction. The fit is on the athletic side, with no bagginess to speak of, yet trail oriented knee pads do fit well under the shorts thanks to a 11.5-inch inseam, which covers most of my knees. This airy feeling and athletic fit does come with a caveat: the Dirt Roamer shorts have only one pocket — a vertical zip pocket on the left thigh large enough to hold a cellphone and a bar. This isn’t a limitation for me personally, as I prefer to wear a backpack or hip pack. Left: Close-up of the zipper and button closure. Right: Close-up of the zipper found on the left thigh, with a glove size large hand for reference. 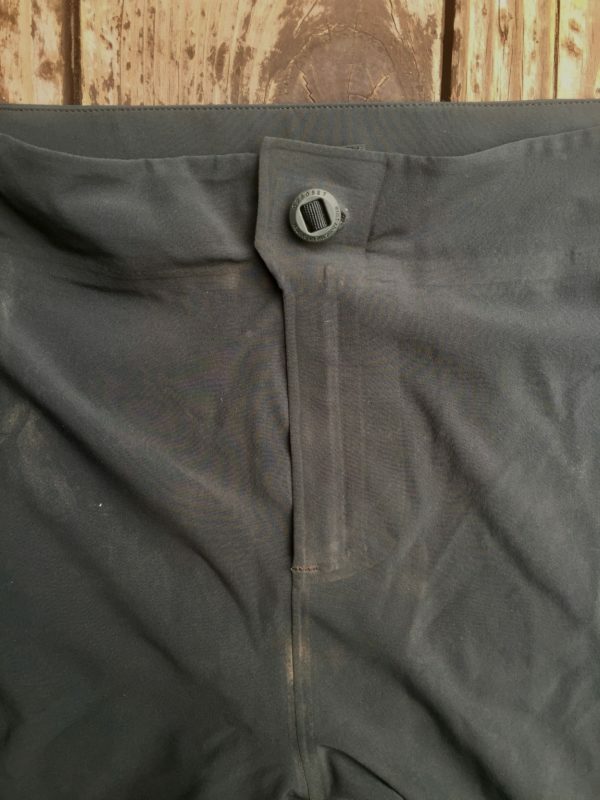 Lastly, these shorts held up to abuse on both ends of the spectrum, including crashes on dry desert trails and multi-hour rides during torrential rainstorms. While not waterproof or made of especially tough material, they have yet to show signs of wear and I have not had them soak through during rain and mud-filled rides. I am 6’1 (185cm) with a 31″ (78cm) waist and weigh 165 lbs (75 kg) and tested the 32-inch-waist shorts. The Dirt Roamer shorts retail for $99 (chamois not included), and are available in sizes 28-40. The color I tested is called Carbon. Manufactured using Bluesign-approved methods, the Nine Trails Jersey is a 100% polyester top with an athletic fit that is roomy enough to accommodate any shapes you might throw while riding. A zip pocket large enough for a bar and emergency cash can be found at the right hip while a drop seat keeps the jersey from riding up while in aggressive biking positions. Flatlock stitching, premium fabric selection, and articulated seams have earned this jersey a place at the top of my jersey heap. The Nine Trails has more of a soft cotton feel than polyester and I have yet to notice any chafing or rubbing. The fabric breathes on par with any other manufacturer’s cycling line and includes odor control technology which is a nice touch. I’ve found the jersey doesn’t retain sweat stains, transitioning seamlessly from the trail to the coffee shop or bar without announcing your presence as a cyclist. The 3/4 length sleeves are relatively common nowadays in cycling apparel, allowing for breathability and moderate abrasion protection. The Nine Trails Jersey’s sleeves are form fitting enough to stay put on the forearm just below the elbow and provide enough cooling to make this jersey ideal for spring, summer, and fall riding. Left: Close-up of the zipper pocket found on the right hip of the jersey with a glove size large hand for reference. 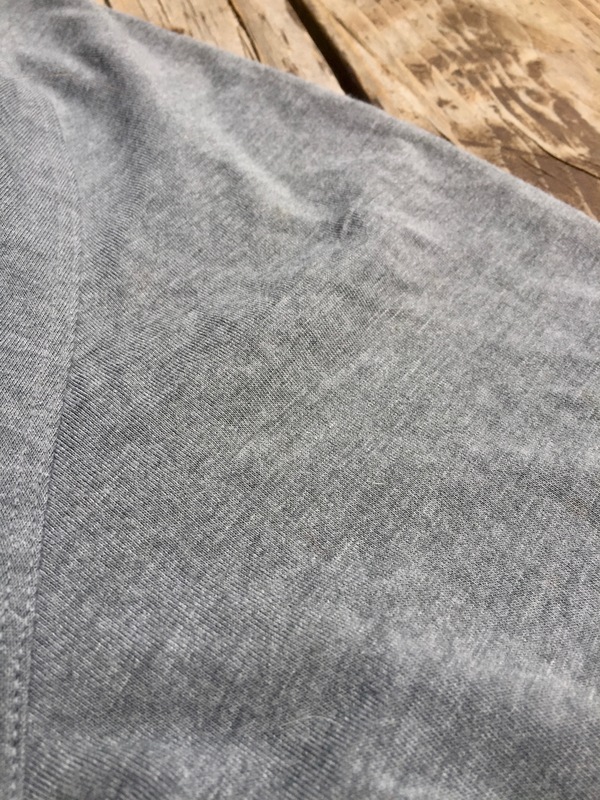 Right: Close-up of the jersey material after months of wear, showing the “jersey” texture and no pilling. My chest size is 40″ (101cm) and I tested the jersey in size medium. 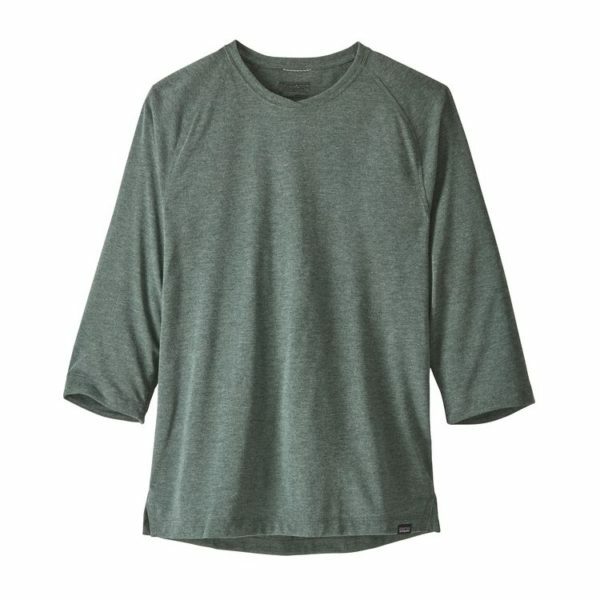 $59 MSRP, sizes XS – XXL. Color tested: Black. Chamois bibs vs. chamois shorts is a personal preference. But when a bib also offers three breathable pockets along the back panel, a strong case can be made for going bib. Patagonia’s bib short was designed with long rides in mind, incorporating breathable stretch fabric, mesh side panels, an Italian chamois, and ample storage. The chamois found in the Endless Ride Liner Bibs fit me extremely well. With such a variety of sit bones and body shapes, I cannot make any guarantees that it will be better or worse for any other individual. 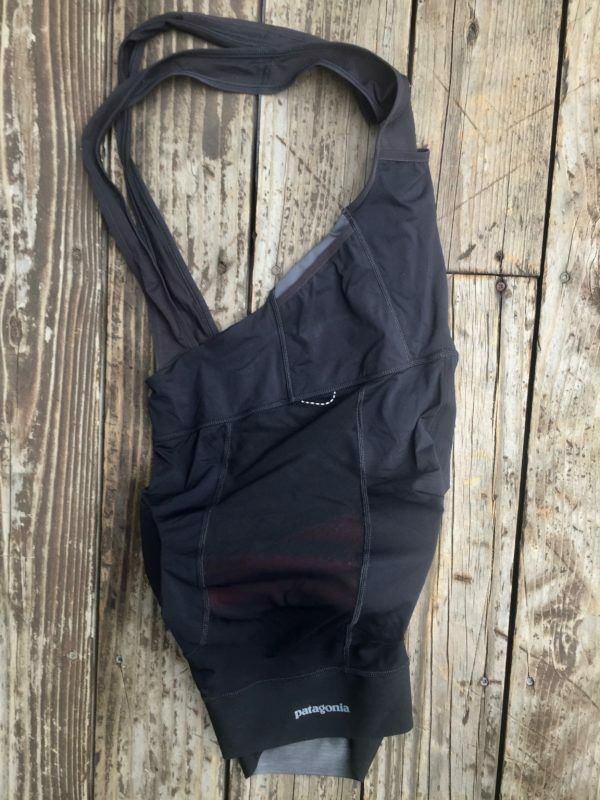 Beyond general fit, I found this bib to be extremely comfortable and breathable, with no chafing from the shoulder straps, nor any overheating during hard efforts. There are three pockets on the back panel of the bib; the center pocket is intended to carry a water bottle, while the pockets on either side are water-resistant to provide a safe space for snacks or electronics. For rides shorter than two hours, I found these pockets can carry all essentials, allowing me to ditch the backpack. If I had someplace to refill the 500ml bottle the back pocket accommodates I could easily carry enough food in the liner to last for a 4-hour ride. I won’t model the bibs alone as they are quite revealing, as noted by the ability to see the red chamois through the mesh side panel. No large grippers are found on the leg portions, but some silicone is present to prevent any movement of the bib short up your thigh. Inserting bottles into the central pocket of the bib is easy, but I haven’t yet been able to master this skill while riding. I tested the bib shorts in size medium. $129 MSRP, sizes XS- XXL. Only available in Black. I am a fan of minimalism, so for me, Patagonia has hit a home run right off the bat, with their apparel being exactly what was missing from mountain bike clothing options since we adopted the Moto-inspired look back in the 90s. 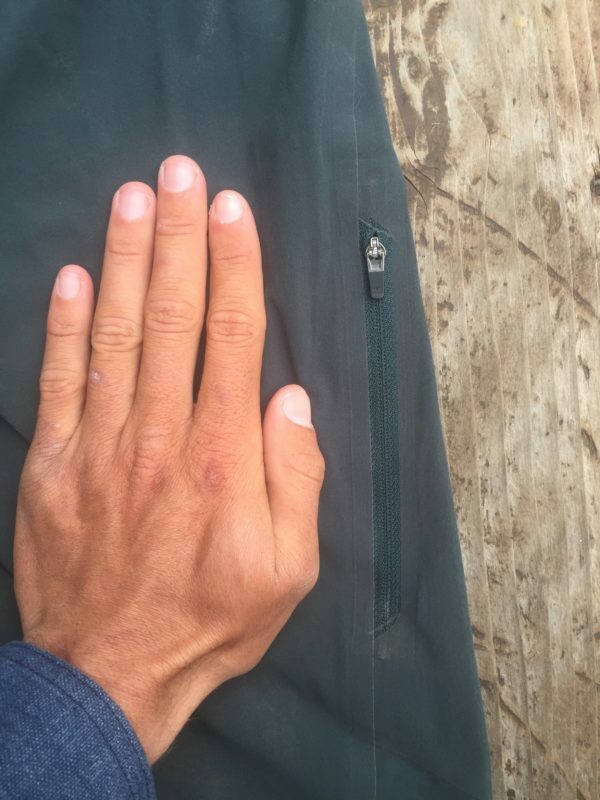 I have worn everything from lycra skin suits to baggy DH clothing and find that the gear from Patagonia suits my general style of simple, clean earth tones better than anything I have found previously. The only logo to speak of is a small one located on the lower left-hand side of the jersey and a very small screen print logo on the lower left leg of the shorts. I realize that style is very subjective, and many readers may prefer the louder graphics and perforated material provided by other brands to Patagonia’s look. Besides fashion, most of us also care about performance and durability, which Patagonia claims to have tested to the highest degree. Overall I really enjoy wearing the Patagonia kit on rides and there aren’t really any modifications I would ask for down the line. Price wise, Patagonia’s line is on par with much of the industry, and well below other premium brands. 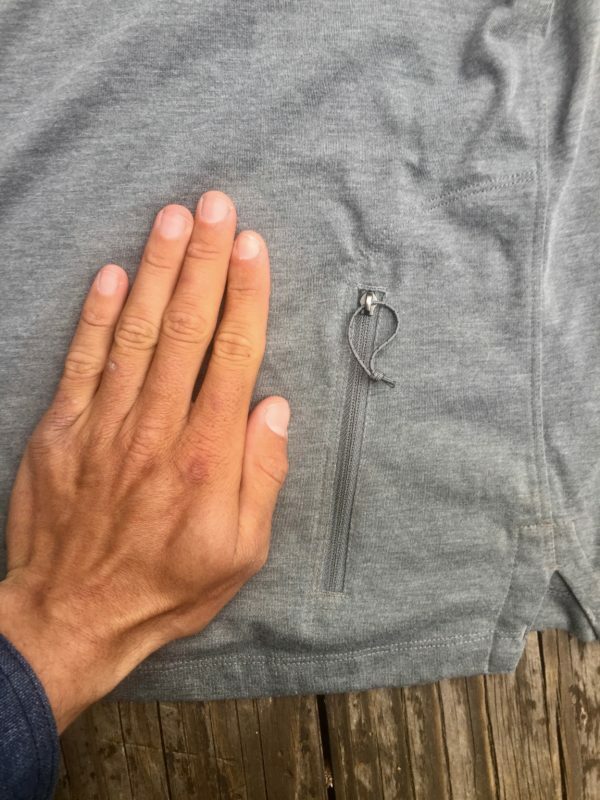 These products are backed by Patagonia’s warranty program, like all of their other gear, meaning any rip or non-functioning zipper can be sent in for repair. We would like to thank Patagonia for providing this kit for review.